YARDLEY, PA--(Marketwire - October 1, 2010) - William Higginson, President and Chief Operating Officer of Journal Register Company, a leading local news and information company, has been named a Production All-Star by Editor & Publisher Magazine. Higginson, named the Company's President and Chief Operating Officer in March, has been with Journal Register Company and its predecessors for 24 years. The announcement is featured in the October edition of Editor & Publisher. "Bill's deep understanding of production is key to our transformation to a Digital First company," said John Paton, Chief Executive Officer of Journal Register Company. "This honor is a wonderful recognition of Bill's contribution to not only Journal Register Company but to the industry as well." In the past decade Mr. Higginson designed and oversaw the construction of the Company's two leading press halls in Exton, Pennsylvania and Macomb, Michigan. Mr. Higginson also designed Journal Register Offset, which consolidated six printing facilities and features a 42 couple Man Roland Geoman press. 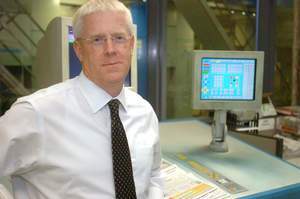 The plant now prints more than 60 newspapers -- and at such high quality that it was accepted into the 2006-2008 International Newspaper Color Quality Club competition run by Ifra. "Bill Higginson is the very personification of the newspaper industry's transformation -- and the critical role that smart, innovative production executives had and continue to have as newspapers take that leap," said Mark Fitzgerald, editor of Editor & Publisher. "He started literally on the pressroom floor as a flyboy and went on to lead Journal Register projects that achieved state-of-the-art printing quality with new and efficient plants. And now, he's Chief Operating Officer as Journal Register implements its company-wide digital-first strategy and is transitioning into both a manufacturing and distribution outsourcer and 'in-sourcer.'"